The Sony VAIO SB Series (VPCSB16FG) represents all that is good about mobile computing: it's a thin, light, well built and attractive 13in laptop, and thanks to 2nd Generation Intel Core CPU technology, it also possesses great battery life and fast performance. We're quite taken by it, and think it's an excellent buy for business users, and indeed anyone who wants a well featured 13in laptop. It may even convert some Mac users. Business users with an eye for style and a need for speed will love the Sony VAIO SB Series. It's a 13.3in notebook that runs Intel's 2nd Generation Core i5 CPU (otherwise known as Sandy Bridge), so you know it's very fast, and it also has a slim and light (1.7kg) body that feels sturdily built. Best of all, it has a battery that will last almost for an entire workday. We like it a lot, especially since it also has a reasonably cheap price, and we also think it looks and feels much better than the Macbook Pro. The VAIO SB Series is the type of laptop you just don't get tired of using. It has good looks and a very comfortable keyboard with isolated keys that are backlit. The backlight has a slightly purple hue and it's a beautiful thing to look at while you type for long periods into the night. The other great thing of the SB Series is that its build quality is very sturdy, yet it's also a very light notebook. It won't be a chore to carry it to and from the office each day, and you won't get tired of using it on you lap for long periods of time either. When used for long periods of time, the base will get a little warm, but it won't be enough to make you feel uncomfortable, unless you are constantly running programs that require a lot of CPU or graphics power. There is a cooling fan installed in the rear of the chassis, and it kicks in when the CPU or graphics adapter is under a heavy load, it's a relatively loud fan and it can get annoying if you are using the laptop to crunch heavy workloads while you're in a quiet room. 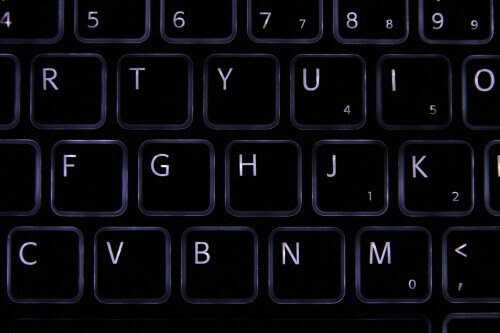 The backlit keyboard has a slight purple hue and it looks great when typing at night. But the VAIO SB Series is more than just a good looking and well-built laptop. It's also very fast. It recorded times of 41sec and 50sec in our Blender 3D rendering and iTunes MP3 encoding tests, respectively, and it only took 57min to transcode a DVD file into a 1.5GB Xvid file. This performance can be attributed directly to the 2.5GHz 2nd Generation Intel Core i5-2520M CPU, which is one of Intel's latest and greatest. It runs more efficiently than the first generation Intel Core i5 CPUs, and it can even hold a candle to first generation Intel Core i7 CPUs. The Core i5-2520M is a dual-core CPU with Hyper-Threading (so it essentially runs as a quad-core CPU) and it utilises Turbo Boost. When the thermal conditions are right for it, the CPU increases its speed automatically up to a maximum of 3.2GHz. We noticed that it ran at 3GHz for the majority of the time during our tests. The Dell Latitude E5520, which runs a 2.6GHz 2nd generation Core i5 CPU (Core i5-2540M), also ran consistently at this speed. The rest of the VAIO SB Series configuration is 4GB of DDR3 SDRAM, a 320GB, 5400rpm hard drive and a dual graphics setup. The VAIO SB can make use of either the integrated Intel HD 3000 graphics in the CPU, or it can run the AMD Radeon HD 6470M discrete graphics adapter. The two graphics cards are included so that you have a choice between boosting the 3D graphics performance when you need it, or prolonging longer battery life when you are travelling. The difference in battery life between them is huge! 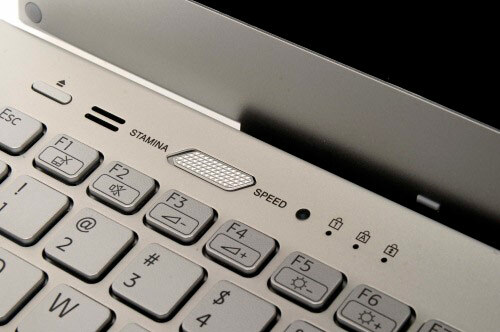 A physical switch is located just above the keyboard, which allows you to choose from 'Speed' or 'Stamina', and you don't need to restart the system any time you switch. The difference in performance between the AMD Radeon HD 6470M and the integrated Intel HD graphics is less than 1500 in 3DMark06 (5185 for Radeon graphics and 3760 for Intel graphics), which is not significant. Apart from a little more speed, the Radeon adapter gives you DirectX 11 support. The physical switch for the graphics adapters. In terms of battery life, when you switch to Stamina mode, the power profile changes to 'balanced' and the integrated Intel HD graphics are used. In our battery rundown test, in which we loop an Xvid-encoded video, Stamina mode gave the laptop a life of 6hr 5min away from an outlet, which is a brilliant result. If you weren't watching videos all day and wanted to get some work done, you could realistically get a whole work day out of the battery. A second battery can be added to the VAIO SB Series (even while it's running), which well and truly supply you all day battery life, but of course, add a little more bulk to the laptop. When we switched to Speed mode for our standard battery test, in which we disable power profiles, enable Wi-Fi, maximise screen brightness and loop the same Xvid-encoded video, the battery lasted a more modest 3hr 19min, which is still a great result when compared to other 13in laptops we've seen, such as the Samsung Q330. Other features that make the VAIO SB Series notebook stand out include the beautiful backlit keyboard that we mentioned earlier, an ambient light sensor, which detects the amount of light in a room and adjust the brightness accordingly (it worked very well during our test period and at all times made the screen a pleasure to look at), a movement and vibration sensor for the hard drive and a fingerprint reader. You can use the fingerprint reader for security when logging in to the system, and you can also use it as a way of quickly logging on to regularly used sites, when you're about to enter your login details for a website, the credential management software will ask you if you want to store the details so that they can be accessed by a swipe of your finger next time around. The screen of the VAIO SB Series is very thin (around 6mm) and it's held by reasonably strong hinges. It has a matte finish that's not prone to reflecting room lights, so it's perfect for use in an office environment. It's easy on the eyes and it has decent viewing angles. Its native resolution of 1366x768 is standard for a 13in notebook. Around the edges of the Sony's base you will find a slew of useful connectivity and a built-in DVD burner (its eject button is just above the keyboard). However, all the ports (except for the headphone port) are located on the right side of the chassis. This can be a problem if you're a lefty and need to use a corded mouse, as you will have to run the cord around the back of the screen. The array of ports includes USB 2.0, VGA, HDMI, Gigabit Ethernet, and most impressively, a USB 3.0 port. You also get a webcam, separate SD and MemoryStick Duo slots, a physical Wi-Fi toggle, a combination headphone/microphone port and 802.11n Wi-Fi. With a weight of only 1.7kg, and a magnificent combination of good looks, useful features, super long battery life and fast performance, the Sony VAIO SB Series (VPCSB16FG) is sure to stand out from the crowd for a long time to come. It's one of our favourite notebooks to date and we think any user who is in the market for a light and powerful 13in laptop should put this right at the top of their consideration list. Executives, in particular, will be very pleased with it.